Our summary and fast facts about Dolley Madison provides an interesting and easy way to learn about the life of the First Lady of President James Madison. Dolley Madison was a highly popular First Lady well known for her wit and her charm. Intelligent and vivacious she was a much admired hostess at the White House. Dolley had the foresight to order many national treasures to be taken to safety during the War of 1812 with the British during which the White house was attacked and set ablaze. The ghost of Dolley Madison is said to haunt several areas of Washington D.C.
Facts about Dolley Madison - First Lady, the "Queen Mother"
Dolley Madison undertook the role of First Lady to James Madison, the 4th President of the United States who served in office from March 4, 1809 to March 4, 1817. What was the life of Dolley Madison like? The Facts about Dolley Madison covers important information, dates and interesting facts about her birth, her early life, her family, her personality with a biography and the accomplishments of Dolley Madison as the First Lady of the United States of America. Facts and Info: This fast fact sheet provides important information about Dolley Madison, First Lady of the United States of America. When and where was Dolley Madison born? She was born on May 20, 1768 in New Garden Quaker Settlement, North Carolina. her birth name was Dorothea Payne Todd. What was her relationship to President James Madison? Her first marriage to John Todd, Jr. was in 1790 but she was widowed in 1793. On September 15, 1794 Dolley married James Madison. When and where did Dolley Madison die? Dolley died on July 12, 1849 in Washington, D.C.
Facts and Info: Dolley Madison assumed the position of First Lady to President James Madison. She witnessed the important events of his presidency that included the Barbary War and the War of 1812 between the US and Great Britain during which time the White House, was burned in the Burning of Washington DC. "And now, dear sister, I must leave this house or the retreating army will make me a prisoner in it by filling up the road I am directed to take. When I shall again write you, or where I shall be tomorrow, I cannot tell!" An extract from a letter that was written by Dolley just before the British burned the White House in 1814. Facts and Info: This highly popular First Lady, Dolley Madison, was known as the 'Queen Mother'. Following her term as First Lady, and extending after the death of her husband, it became traditional for incoming Presidents to visit her to receive her blessing before taking office. Her birth name was Dorothea but she was always called by her family or pet name Dolley. Facts and Info: President Zachary Taylor was the first to refer to her as “First Lady” when delivering her eulogy. Dolley was also the 1st First Lady to be featured on a silver dollar and it was she who introduced the tradition of the Easter Egg Roll. Facts and Info: First Ladies are not elected so have no official role. Their accomplishments are therefore based on their own particular wishes that ranged from political interests, humanitarian and charitable causes or duties relating to their family or social responsibilities. 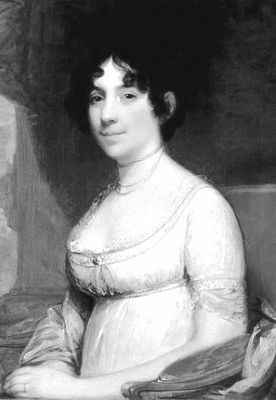 The causes and accomplishments of Dolley Madison were demonstrated in her support of orphans as patroness of the Washington Female Orphans Asylum. She also played an important role during the War of 1812. As the British army grew closer to Washington in 1814, Dolley ordered that White House staff to save an historic portrait of George Washington and other national treasures when the White House came under attack. Facts and Info: Dolley came from a highly influential and well connected, in fact, sister had married George Steptoe Washington who was a nephew of President George Washington. Her first husband was John Todd. Dolley was widowed with a young son John Payne, who was called "Jemmie", her other son had died. Dolley Payne Todd married James Madison on September 15, 1794. A bright vivacious hostess she arranged popular social gatherings at the White house. The War of 1812, known as America's "second war of independence", between the US and the British threw Washington into chaos. Washington had little strategic value but, as the new nation's capital, its destruction would have a significant impact on Americans. On August 24, 1814 the American forces were defeated at the Battle at Bladensburg. A force of 4000 British soldiers headed for Washington, intent on its destruction. The inhabitants fled the city, including Dolley Madison who had the presence of mind to take a full length portrait of George Washington with her. Dolley fled by carriage across the Potomac and the British set Washington ablaze. The thick sandstone walls of the White House and Capitol survived and the Capitol was reconstructed from 1815 to 1819. Dolley Madison and the President resided in The Octagon House for the remainder of his term. Dolley Madison contributed to the decoration of the White House as it was rebuilt. 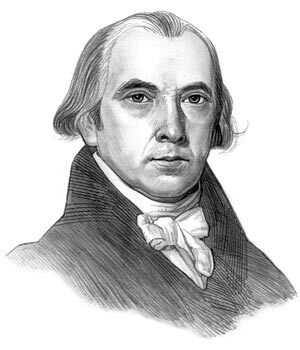 James Madison died in 1836. Dolley Madison was forced to sell their home, Montpelier, to pay off her son's gambling debts. Dolley was helped by the government who gave her a small pension. She lived in Washington and received all the new presidents in her house. Dolley died on July 12, 1849 at the age of 81 years old. Facts and Info: The ghost of Dolley Madison is one of the most famous and most frequently seen ghost that haunts Washington DC. The Sightings of the Dolley Madison ghost have been reported in the White House Rose Garden, the Octagon House and most famously the Dolley Madison house - all located in Washington D.C. The legend of the ghost of Dolley Madison appearing in the White House Rose Garden relates to a story that Edith Galt Wilson, the second wife of President Woodrow Wilson, wanted to redesign the White House Rose Garden that had been planned and created by Dolley Madison. The White House Gardeners were about to did up the rose garden when the ghost of Dolley Madison appeared. The ghost apparently frightened the life out of the gardeners. Not one of them would touch the Rose Garden - and what's more no one ever made a second attempt. The idea was dropped and Dolley's Rose Garden remains in tact. The most frequent sightings of Dolley Madison's ghost have been made at the Dolley Madison House, the American colonial-style historic house located at 721 Madison Place in Washington, D.C. The house was once the residence of former First Lady who lived there from November 1837 until her death in July 1849. It is said that Dolley's ghost haunts the area where the porch on the west side of the house used to be. Her smiling ghost has been reported rocking in a chair, a serene ghost as opposed to the angry ghost of the White House Rose Garden. The Facts about Dolley Madison provides a fast overview of the key facts and events in the biography about her life and accomplishments as the First Lady of James Madison. The following video enables you to sit back and listen to the history of the personal and political life of James Madison, the man she supported. A useful biography and educational resource for kids, children and schools learning about the life and family of Dolley Madison.